Both Chestermere’s economy and its charities got a little boost as the new Cobs opened its doors Nov. 29. “We really believe that we want to do as much business and be as much benefit in the community locally here,” said Co-owner Collin Nyberg. As is the tradition when Cobs opens a new location, the entire first day’s sales were donated to charity. Nyberg and his wife and business partner Bevin Bannister chose to support local and picked Christmas with Dignity as their charity. “We want to make sure the town’s taken care of first,” he said. The grand opening was busier than they had expected with line ups out the door of the bakery located beside the Starbucks on Marina Drive. “It’s been a crazy morning,” said Nyberg. With the opening being busier than they had expected, they were able to donate $5,075 to Christmas with Dignity. “It’s way more than I though it’s going to be so I’m really happy for you guys and glad to help,” said Nyberg of the donation. In addition to Christmas with Dignity, the couple will be supporting the food bank and local school programs with donations of bread every day. The new bakery is also the most recent step in the city’s ongoing efforts to increase the commercial tax base in Chestermere. “We’re extremely pleased to have a business opening up in Chestermere,” said Chestermere’s Mayor Marshall Chalmers who was joined by Councillor Cathy Burness in breaking a loaf of bread in lieu of a ribbon cutting at the grand opening. Chalmers said that it is also great to see the increase in jobs in the local economy. Cobs is employing 14 people, all from the community. “That’s a huge boost to our community here when one business can step up and create that kind of employment,” he said. 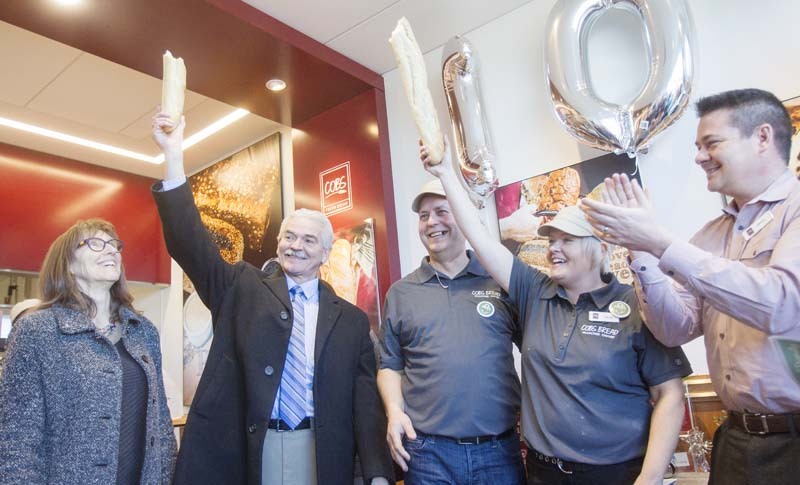 The opening of the bakery adds another layer of distinctiveness to Chestermere as it is the 100th Canadian franchise. The journey to opening the bakery started shortly after Nyberg and Bannister moved to Chestermere two years. The couple’s decision to open the bakery came last year when Nyberg realized that he was about to lose his IT job due to the downturn in the economy. With the end in sight at his IT job, Nyberg said that he wanted to do something else and started looking at his options. “We were looking to bring something that Chestermere needed,” he said. Nyberg said that his wife had wanted to see a Cobs in Chestermere so they looked up owning a franchise and found out Cobs was looking for franchisees. “So we jumped on it right away,” said Nyberg. Getting the store ready to open has been a lot of work. “We’re here now and Wow,” he said of the reception their grand opening received from the community. Getting the bakery ready to open is just the start of the work for the pair who now need to make sure that they gain the support of the community and are able to stay open. Mayor Chalmers did his part telling the crowd on opening day to make sure they keep supporting the new business.